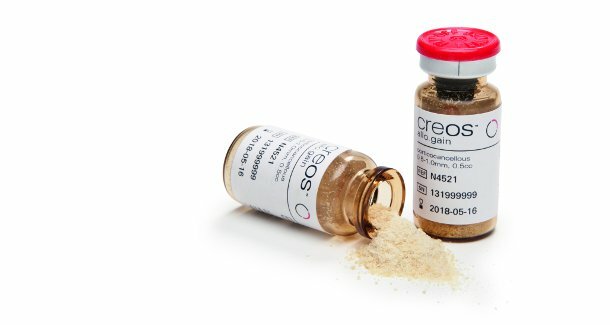 Nobel Biocare’s creos allograft line features a full selection of regenerative solutions in 3 core products: particulate bone graft, demineralized bone matrix (dbm) putty, and a barrier membrane. The creos allo.gain range gives clinicians the flexibility to choose the optimum solution depending on patient indication and personal preference with 5 different types of particulate bone graft. Choices include corticocancellous, cancellous, cortical, and demineralized cortical bone types, as well as a pre-prepared blend of mineralized and demineralized cortical particulate. Also included is a demineralized bone matrix (dbm) putty that comes in a convenient dispenser and is moldable for smooth adaptation to defects. The new creos allo.protect resorbable pericardium membrane serves as an effective and reliable barrier to soft tissue ingrowth during the healing phase. It adapts easily to the graft site and is designed to maintain shape and size when placed. The membrane is available in sizes: 10-mm x 10-mm, 15-mm x 20-mm, 20-mm x 20-mm, and 20-mm x 30-mm. Nobel’s creos xeno.protect (coming soon) is a biodegradable collagen membrane offering outstanding handling properties and an extended barrier function. Since it is produced without chemical cross-linking, optimal properties to support tissue healing are provided.